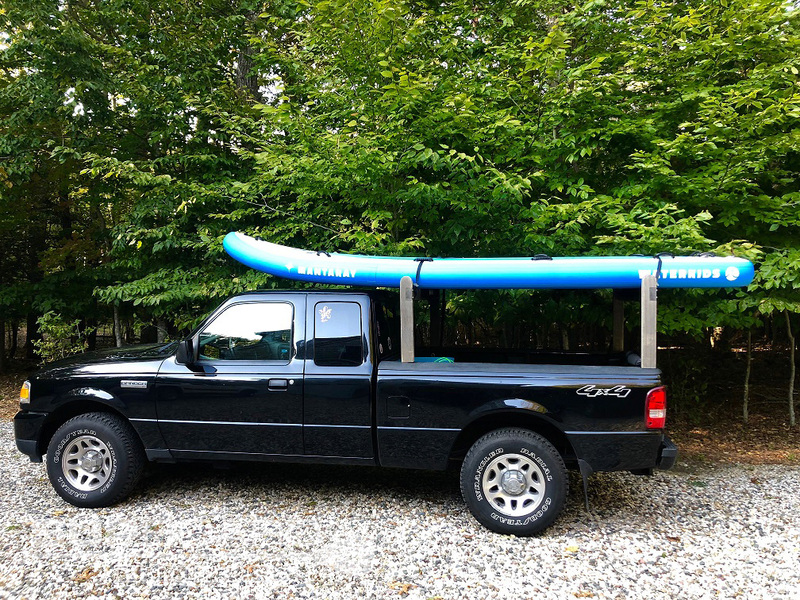 What’s 14 feet long by 4 feet wide but can fit in the trunk of your car, has 11 handles and can ride the river, surf real waves, carry cocktails for four and/or become a floating dock for your kids to jump from all day long? Check out this instant inflatable party on water: the MantaRay by Waterkids, a four-person giant inflatable SUP. The summer weekend’s dream come true. I brought this thing down to the beach, and instantaneously the MantaRay was the life of the party. People were actually lined up to get a turn on it. You’ll feel like the Pied Piper! 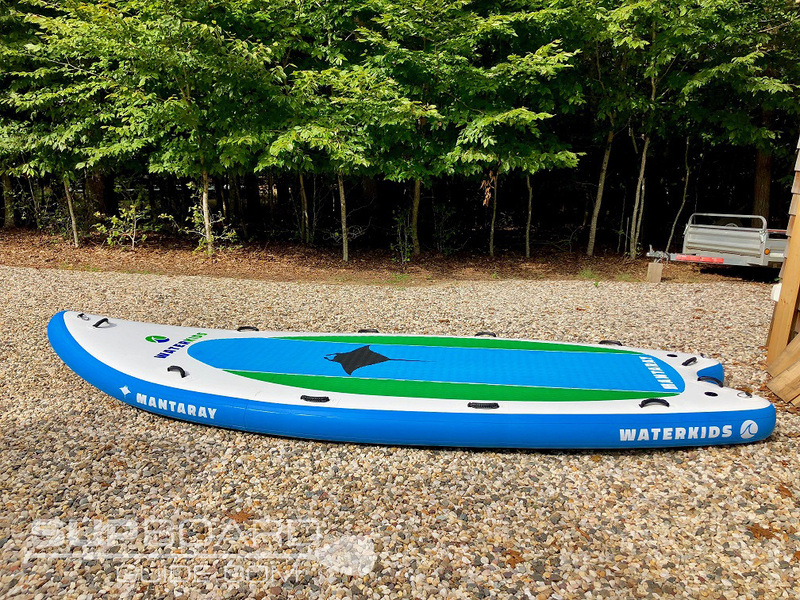 At 14’x4′, the MantaRay is durable and stable enough to pack a load (of kids, adults or just you and your 5 coolers;) and float, surf or dive to your heart’s content. This 4+ person giant inflatable SUP has incredible stability due to its construction similar to that of a whitewater raft. When there’s a gang on board, and a fifth person hops on, the board’s construction takes on the extra weight without shifting the rest. At 15psi, it is rigid enough to avoid the ‘waterbed experience’ of launching those closest to the edge back into the water. Depending on what you want to do, the MantaRay has the overall performance for a broad spectrum of functions. Easy enough to float 4 or 5 people in a flat water bay and enjoy the sunset. Or, you can tie up in deep water and let the kids dive off it all day long. My friends and I decided to test the board’s surfability. With a raised rocker in front and a cutout tail in the back for a small person to hang on and act as ‘rudder’, the chance was too good to pass up. Down at the beach, we found Oscar, a visiting 10-year-old kid from the UK who was only too eager to act as our rudder. 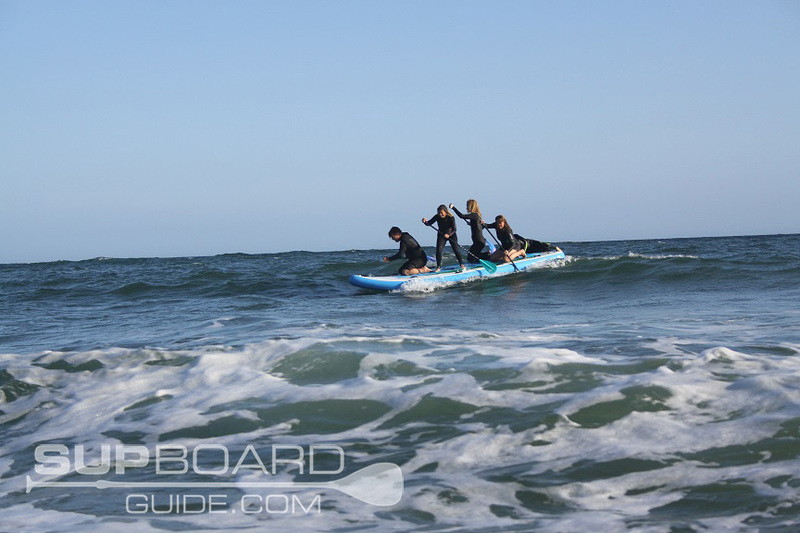 The rest of us immediately reverted to childlike behavior in the excitement of trying something like a 4-person SUP in the surf! The MantaRay’s multiple handles, 11 in all, give plenty of options for a group of 4 (plus Oscar) to pick up and carry its 50-pound weight down to the water’s edge. After roles were assigned and options weighed, we paddled out on our knees exploring the feel and ride of the MantaRay in rolling surf. 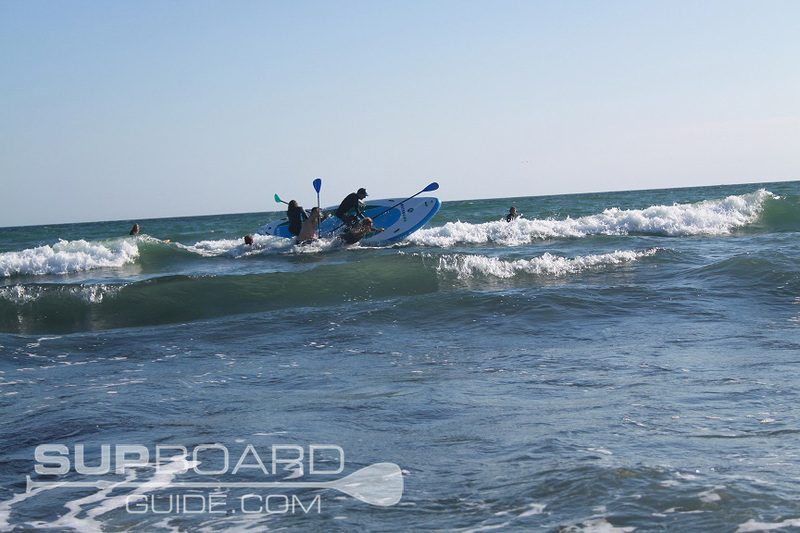 With two paddlers on each side and Oscar, our ‘steersman’, in the back, we found our way out to the surf break. 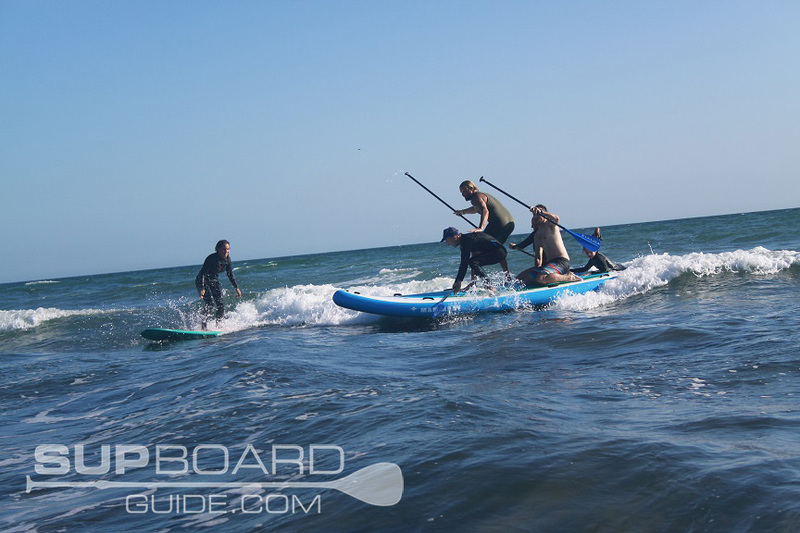 The board moves well when paddlers are in sync with each other, and it turns on a tight radius in order to catch the waves quickly. The members of our ‘team’ needed to work together to motivate the board forward quickly as communication is required to catch waves. Generally, there will be one competitive soul among you who will take charge. Let them run with it, and if it doesn’t work, have them walk the plank and try again! In short, it was hilarious. Competitive paddler, surfer or just out there for fun, the MantaRay offers a community experience you won’t’ forget. There is laughter, frustration at missed waves and mass victory when a swell is caught that doesn‘t send everyone into the water in a giant yard sale. One thing we did notice is that the board, lacking any fin, can slip sideways into the wave and toss the entire lot on board. So, it requires the rudder person to hop off the back as soon as the board is riding the wave and use his/her body weight to direct the board forward. This person should be small, light of weight, ideally have fins on and use the appropriately placed handles at the aft of the board to hang on! Again, communication is key. Once on the wave, paddlers need to stop paddling and lean BACK on the MantaRay to avoid the nose going under and pitchpoling the entire craft. After one fantastic episode of this (wherein I got caught up UNDER the board laughing hysterically) we avoided that accident at all costs. In short, our waves were perhaps 2 feet high, but we all discussed the possibility of the MantaRay’s performance in higher surf. The learning curve would have to be humane because the board had all the stability and maneuverability to make a go of it in larger waves. 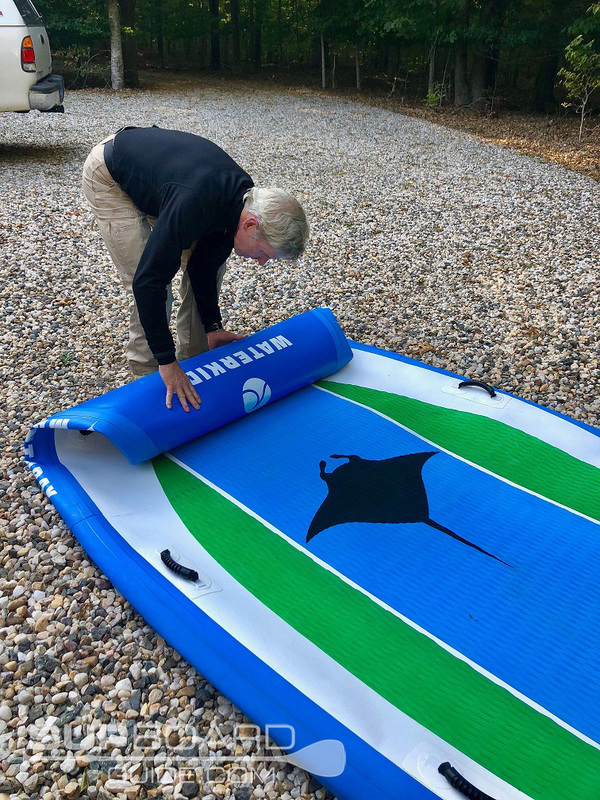 The MantaRay is well made with the same heavy duty durability as a whitewater raft, with taped seams and a diamond cut deck pad. The construction lends it to being river-worthy as well as surfable. It is also strong enough to carry 4 or 5 adult-sized humans and has multiple hand holds (11 in all) to hang onto if you get nervous. 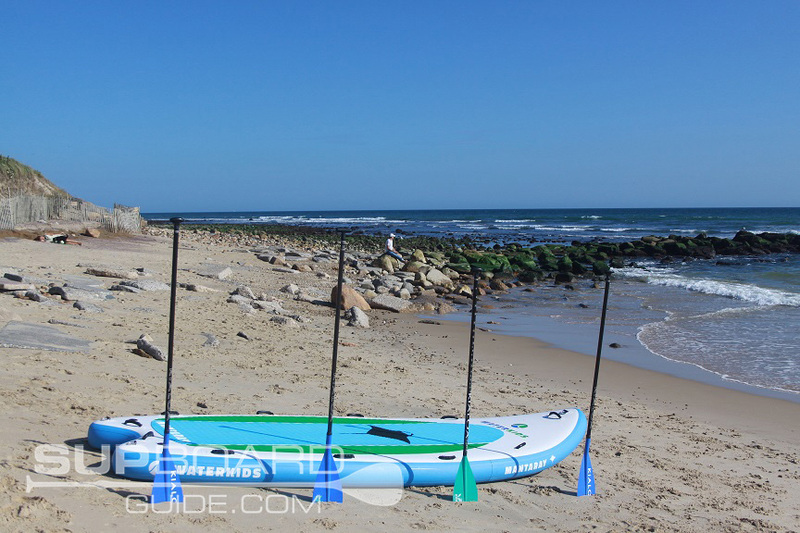 This giant inflatable SUP includes 11 handles for greater performance: 4 on each side, two in the back and one up front for easy carrying. It also sports 3 D-Rings, one up front and two in the back, to lash down your belongings OR tie the board off to a dock or drop an anchor for some raft fun. The diamond cut deck pad keeps feet from slipping and is attractive and durable for overall usage. 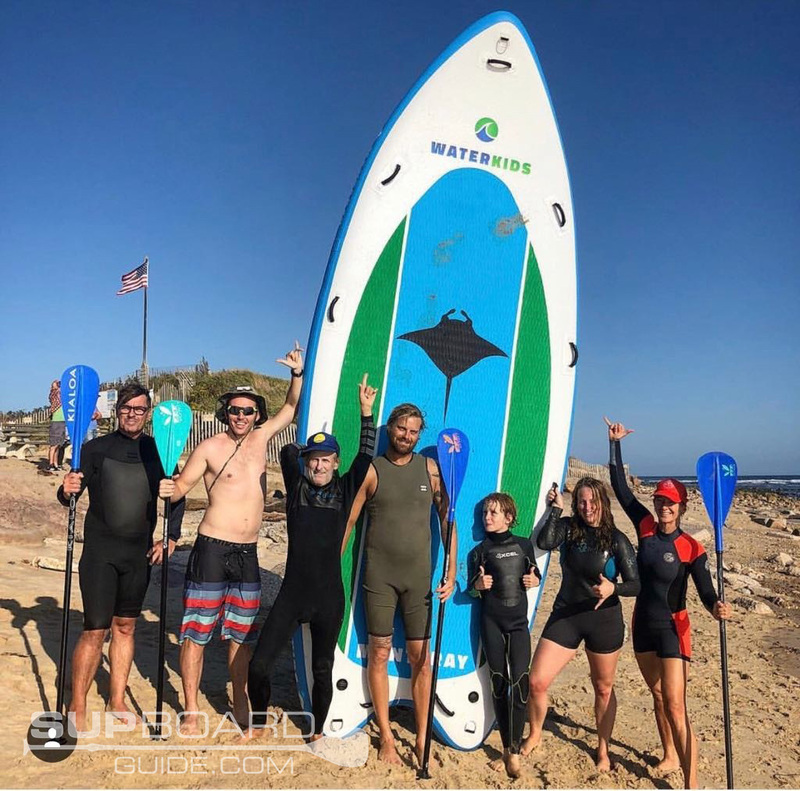 There is no fin necessary on this inflatable SUP as the Waterkids team created the cut out ‘V’ in the tail of the board and added two rear handles meant for the ‘steersman’ who dangles off the back with fins on his feet and uses his body as a rudder when surfing waves. This steersman controls the direction of the board and steers into the wave properly. OK, this is a must-read! Inflating the MantaRay needs to be pre-planned and time set aside. It is no easy task to inflate this 14×4’ board to 15psi in order to give it the strength it needs to be safe and enjoyable fun. There are TWO insertion points for pumps, one on the left side, one on the right so that two people can work together to inflate this beast. After several minutes of straight pumping and not seeing any lift to the material of the board, biceps burning, I took a break. I pretended I didn’t hear the sound of the compressor when I went back upstairs and was ‘pleasantly surprised’ when I came down 20 minutes later to find the MantaRay fully inflated. I would never recommend using a compressor as they are dangerous, but if you intend to use the MantaRay on Saturday, I suggest you get to pumping on Friday so you can complete the task and still have enough bicep strength left to paddle your way away from shore. Deflating the MantaRay was super easy. There are two valves on the tail end of the board. You can open the valve and then turn it to lock it into the OPEN position and hear the pressure drop as the air escapes. Once you’ve noticed a softening of the board pressure, you can help move things along by gently kneeling on the nose of the board and pushing the air toward to tail to escape. Once the board is close to deflation, I started to tightly roll it from the nose. This might take two people as the board is wide and you want the roll square. Just roll it up like you would a yoga mat and press the remainder of the air out of the valves at the back. From there, be sure to close the valves again, and place the safety knobs back on top. Find your carry all strap, slip it in and presto change-o, easy storage for a 14′ beast of the sea! In all seriousness, the board deflated takes up no more room than a couple of standing yoga mats together. It is easy to store in a closet or shed with the pump for ready use the next day the sun is shining. Deflation: ease of air removal 10 out of 10. Easy-peasy! The MantaRay has an original shape and design. Built to mimic the shape of its namesake, the MantaRay comes to a triangular point at the nose and has a huge rocker to the nose of the board. This rocker allows the front of the board to stay above the water when catching waves or riding the river and not ‘pearl’. Pearling is every surfer’s nightmare where the nose of the board goes under while dropping into a wave and the rider slides straight down the board to follow the nose in the most ungraceful of dismounts and dramatic sinus cleanse. 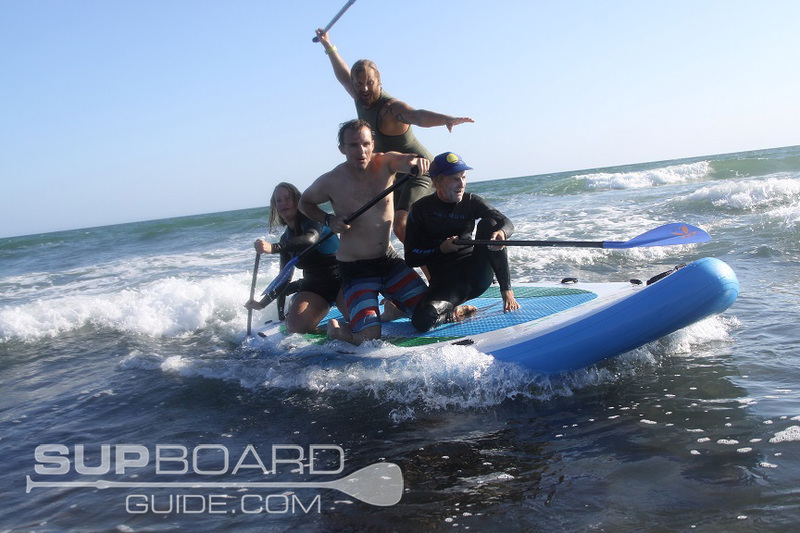 Add a four-person team to that concept and you understand why Waterkids added this dynamic rocker at the front of the board. From its pulled in nose, the MantaRay flares out at the sides to its widest point at 4 feet and then pulls in towards the tail to create the V-shape (more like a ‘U’ actually) where the steersman rides. 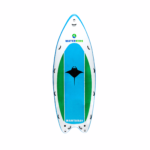 Its overall shape is great for stability, turning and catching waves. Rounded rails on this inflatable’s bottom give it that ability to slide sideways when necessary and charge waves from all angles. As mentioned, three D-rings are present on the board, on up on the nose and two in the back to help you anchor or lash the board to a dock or boat. 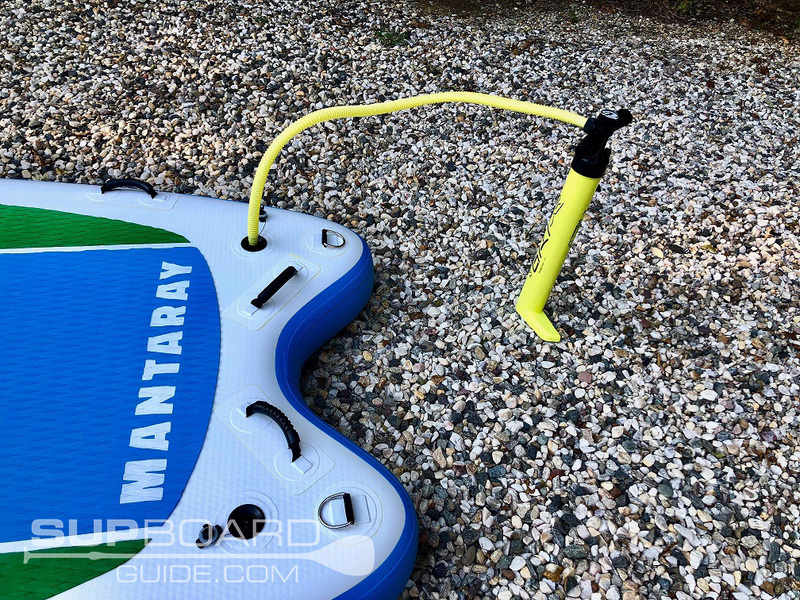 The MantaRay comes with a single hand pump to do the heavy lifting of inflating this massive board. It is a standard, plastic, decent sized pump, but if anything falls short on the MantaRay’s overall set up, it’s this. With such a dynamic and well-constructed board, it might be worth it to find a better pump to get it up to speed quickly. There is a lot of air to pump. And, with the two one-way valves available, it would have been nice of Waterkids to – at least – throw in a second pump to make the work teamwork. What’s the point of two valves if you only have one pump? After deflating the board, you can roll it up into a nice size and attach your carrying strap. 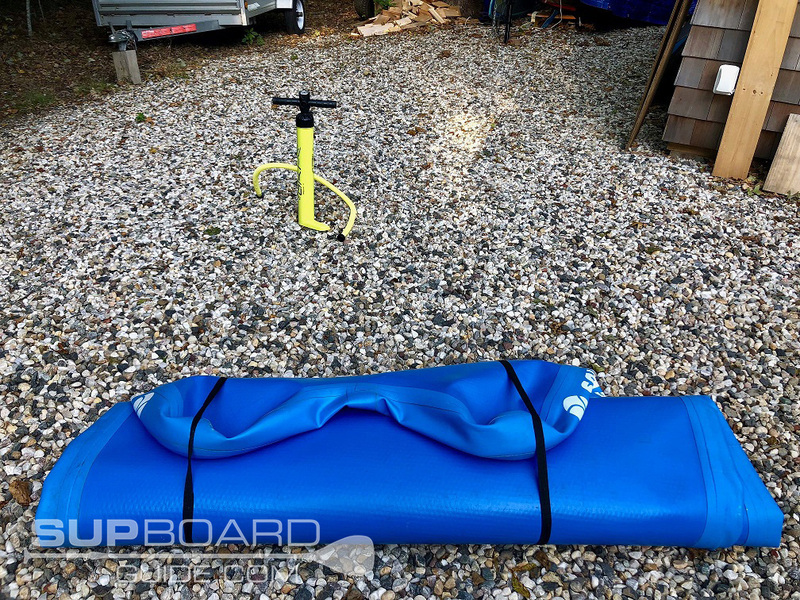 It allows the board to keep from unfurling and makes it easy to leverage it into and out of your car trunk or truck bed. Seriously though, transport of this family inflatable just takes a little thought & ingenuity. I have a Ford Ranger pickup with custom racks. The MantaRay did not fit within the racks so we simply piled it on top of the bed of the truck and slid it forward so a hardy chunk of the nose rested on the cab. Then, using tie downs doubled up (tied together), we looped the straps around the board by going through the handles – two in the front and two in the back – then over the top of the board and secured to the rack system. I made sure while driving to keep it under 70mph to avoid liftoff. By placing the board on top of my racks, the wind was allowed to pass under the board and avoid any harsh friction from that bulbous nose. To transport with a regular or smaller car, I would use the same format. Double loop your (2) 12′ or smaller tie down straps, weave them through the front and back rail-side handles on the board and secure to your car rooftop by running the straps through the car through your open doors. Make sure to cinch down tightly on the straps in case air friction tries to loosen them and leave the board wobbly on top of your car. You’ll feel and hear it if that happens! Just pull over safely and resecure the straps. You’ve got this! Once at the beach, you’ll untie the board and immediately have interested parties and helpers surrounding you to help you bring it on to the beach. You only need two people to handle the board – although more is merrier! 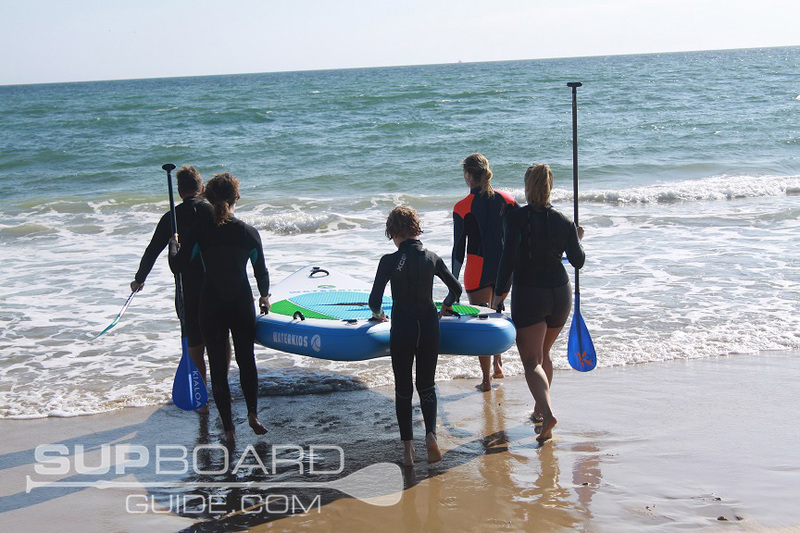 – as the conveniently placed straps on the nose and tail of the board help to carry it places as well as provide a handhold when riding the waves! More fun than a pin cushion under Aunt Harriet’s chair. That’s my final thought on this inflatable giant SUP. You want to act like a kid again or make your kids WILDLY happy for an entire summer of fun? Then the MantaRay is a solid investment. 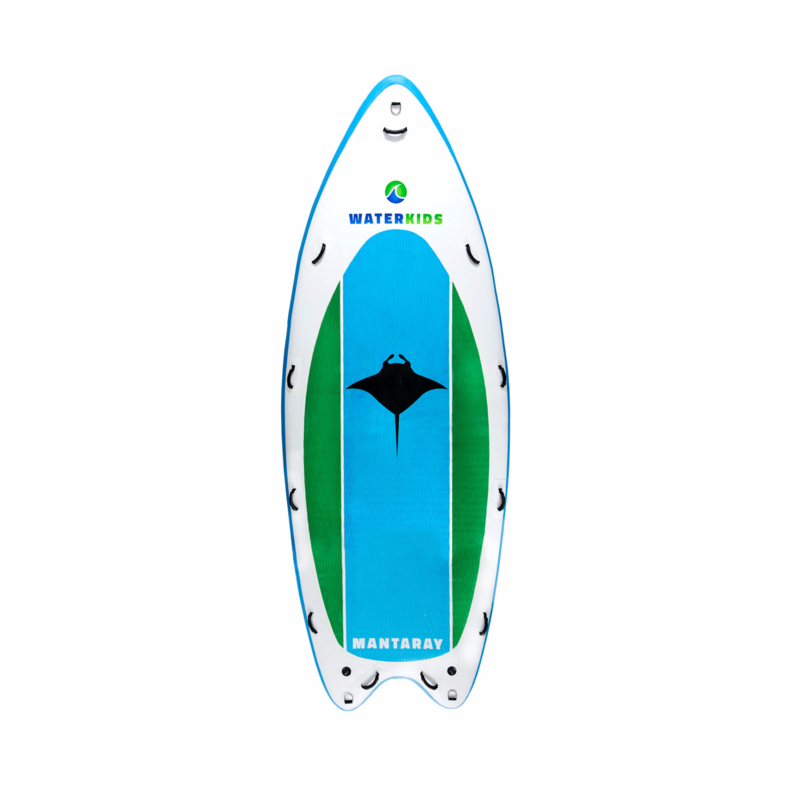 At $1799, the MantaRay is the cost of a good stand up paddleboard, but with a LOT more versatility. 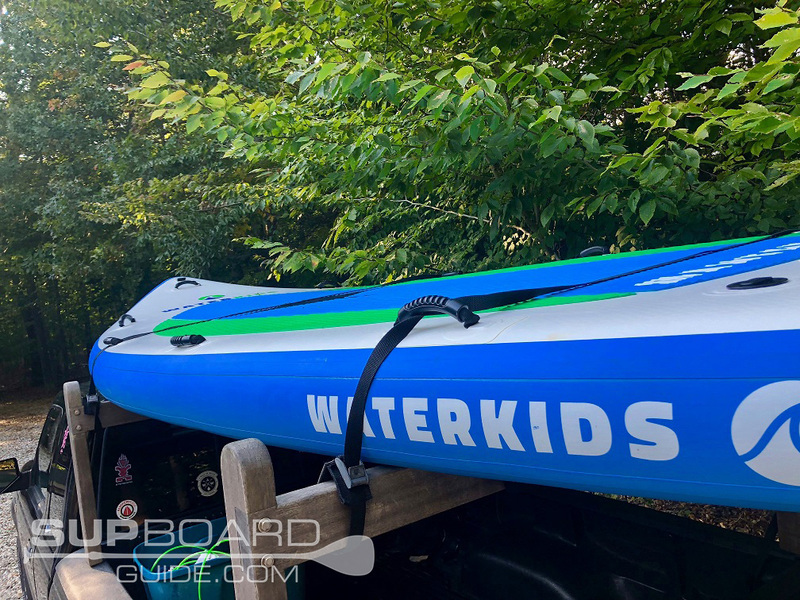 From flatwater paddling or raft usage to river explorations and team building fun, this family toy is worth its weight in gold. Don’t believe me? You should have seen the looks on faces when I rolled into the parking lot with this bad boy strapped to my roof racks. I couldn’t even get out of the car fast enough before people were surrounding my truck asking questions and asking If they could try. I literally met 5 new people that day and watched how people who just met became ‘beach buddies’ by sharing several belly laughs and antics in the water. It’s a community builder, and it’s worth it. And while you’re there check out their other kids’ boards like ‘The Natural’, an all-around 8’ board designed professionally for smaller bodies and performance. Waterkids takes their kids seriously and it shows in the quality of their work. Evelyn is a paddle boarder from Long Island. She's competing in SUP races ranging from 6 to 24 miles. 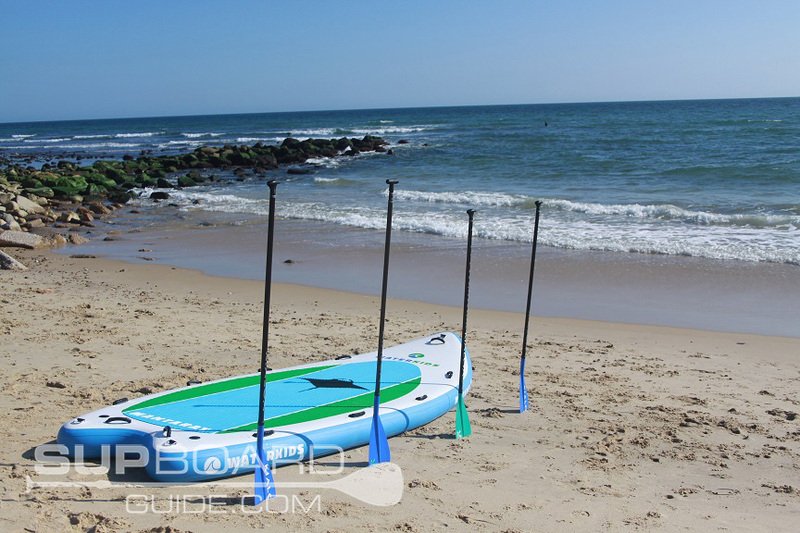 She's a certified SUP instructor and offers SUP clinics in Long Island. She also owns Standupjournal.com and serves as the Regional Director in the SUP division of the International Surfing Association. She's also a Yoga instructor and sponsored by brands like Starboard and Kialoa. SUPBoardGuide.com is a participant in the Amazon Services LLC Associates Program, an affiliate advertising program designed to provide a means for sites to earn advertising fees by advertising and linking to Amazon.com.